HDFC Click 2 Protect 3D Plus is a non-linked non-participating term insurance plan for the individual. 3D in this plan refers to Death, Disability & Disease. This means HDFC Click 2 Protect 3D plus plan provides you coverage of death, disability, and disease in a single plan. You need not purchase a separate plan for critical illness or disability. Generally, a term plan is a simple product that provides a life protection against premium paid. Some of the term insurance product also provide the facility of an accidental rider, premium waiver, and critical illness benefit at extra cost. However, HDFC Click 2 Protect 3D plus is a unique plan that provides 9 different options to the policyholder. Let’s review HDFC Click 2 Protect 3D Plus plan in detail. Option to customize policy with 9 different options. All future premiums are waived on Accidental Total Permanent Disability (available under all options) and on diagnosis of Critical Illness (Available with 3D Life and 3D Life Long Protection options). Life stage protection offers increase coverage on certain key milestones without medicals. One can increase cover every year via top-up options. The special premium rate for female. The Lucrative premium rate for non-tobacco users. 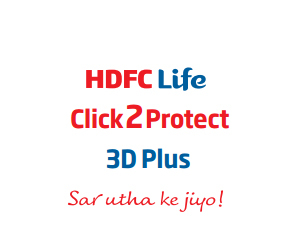 HDFC Click 2 Protect 3D plus comes with following options. Life Option – Under this option nominee of policyholder gets a lumpsum benefit on death or diagnosis of Terminal illness. 3D Life Option – In addition to life option, you will get an additional benefit of waiver of future of premium on the diagnosis of critical illness. Extra Life Option – This option gives you extra life sum assurance upon death due to an accident. Income Option – Income option provide benefit of lumpsum payment and stream of regular income on death of policy holder. Extra Life Income Option – This option gives you benefit of extra life option and Income option together. Income Replacement Option – This option secure your nominee get income stream even in your absence. Return of Premium Option – This option will return all your premium if you survive till the end of the policy period. On death during policy period sum assured will be paid to the nominee. 3D Life Long Protection Option – In addition to the benefits under Life Long Protection Option, you will receive an additional benefit of waiver of your future premiums upon diagnosis of Critical Illness. The process of purchasing this policy is different. You need to first customize your plan by selecting an option. After selection of an option, you need to decide sum assured, policy term. Once you are done you need to give your personal information and pay a premium to purchase this policy. Should you purchase HDFC Click 2 Protect 3D Plus policy? HDFC Click 2 Protect 3D Plus policy seems to be old wine in new bottle. Old plan of Click 2 Protect term plan is launched with 3D benefit and other options. The option given in this term plan seems to be attractive at first instance. However, the basic idea of purchasing term plan is to provide risk coverage. As per me, it will not be wise to mix term plan with any other option. If you have not purchased any other term plan you can consider HDFC Click 2 Protect 3D Plus policy. This plan is recommended with Life Option only. However, you should compare this plan with all other online term plans available in the market before taking any decision.